If you don’t know what the Warrior Dash is, it’s one of those “extreme” 5Ks through the mud and with obstacles. We had to jump over fire, swim under barbed wire and climb a rope ladder suspended over a ravine, among other things. I really should have trained more, but I’m proud I made it through. I have to say, the free Miller Lite at the end never tasted so good! It’s time for me to ask you for money again. I only do one charity thing a year – Kicks for a Cure – so this will be the only time I hit my trusty readers up for cash. 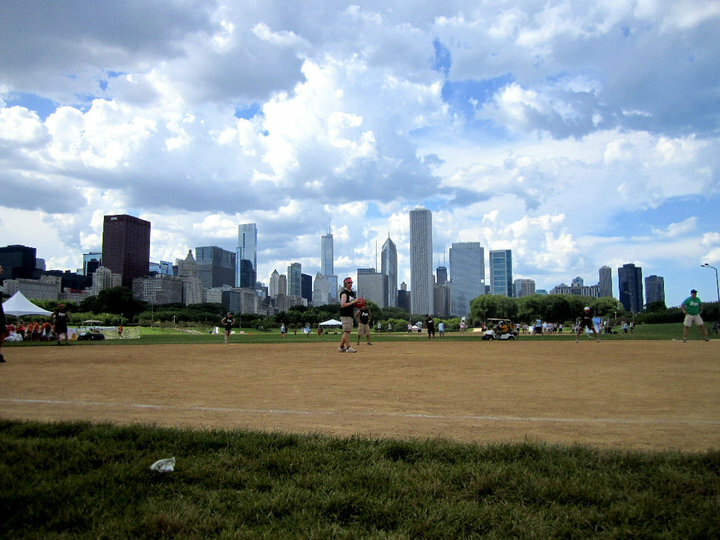 You guys might remember from last year, but Kicks for a Cure is a huge kickball tournament in Chicago’s Grant Park. The donations go to Receptions for Research, a foundation started by tight end Greg Olsen (no longer a Chicago Bear, but apparently still hosting the event) to raise funds for breast cancer victims and their families. I’m a little late joining the team because I was waiting to see if I’d be moving the last weekend of June (the event is June 30), but now that I’m not, it’s full steam ahead! I need to raise at least $100 in about three weeks. Breaking news: THIS IS IT! So here’s what went down: I found a listing on Padmapper for a building off the Irving Park brown line stop. I snuck out of work early to go see it because I knew it’d go fast – and good thing I did! There were actually two open units, and by the time I got there (5 p.m.), one had already been signed on (after 3-4 viewings during lunchtime). I literally ran home (supes sweaty) to get my checkbook and filled out the application at red lights on the way back. They ran by credit and background check, and I passed! I signed the lease this weekend, and I move in August 1. THANK. GOD. This place is only a block from Mayor Emanuel’s house. Think our street will be the first to plowed in the winter? That’d be a pretty awesome pro. But the biggest pro? No more trolling Craigslist! DISCLAIMER: The living room will not be Flubber-colored when I move in. I’ve had my fair share of bad luck with Pinterest recipes – mostly in the baking department. I probably shouldn’t blame it on Pinterest, but instead on my cooking skills, but still, it’s frustrating. But I finally found one I like: oatmeal lemon creme bars. I whipped these up for a staff BBQ tonight, and I have to say, they turned out very well. They’re light and refreshing, and I think they’d be pretty good with ice cream too, a la mode. Except for the zesting, the recipe was really easy. I’d never zested anything in my life – it’s a huge pain! 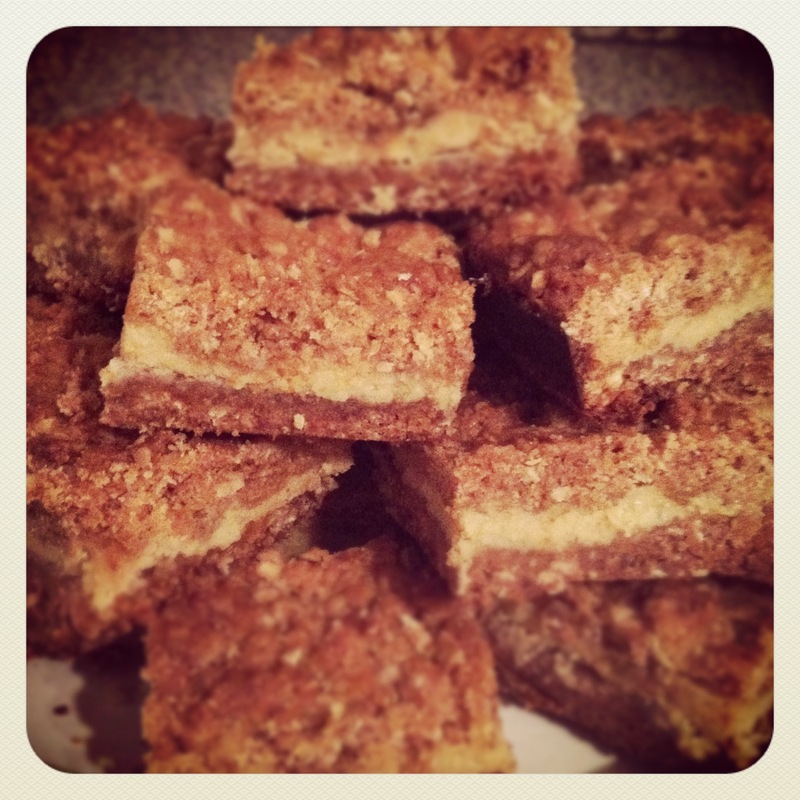 Check out the recipe from Maria here. I’ve lost track of the number of apartments I’ve looked at… It’s gotta be hovering around 20. Sad, I know. I’ve been pretty picky about location up until now because I knew I had some time to work with. But this apartment hunt is starting to take a toll on my health – damn anxiety! – so I decided to look at a place in Ravenswood. The only real cons of this place are location (actually it’s close to public transit and easy to get to friends, just three stops north of where I live now) and lack of outdoor space. There’s little patches of grass, but no courtyard or anything, despite being in a large complex. But all in all, the space was good, and it had an updated kitchen and bathroom. I probably would have filled out an application right then and there, but this is a sublet and the girl didn’t have the paperwork from the management company yet. And I haven’t heard from her since so… guess that’s a no. I’m glad I checked it out though because it opened my eyes to the neighborhood. Ravenswood, you’re a-ok to me. I love that feeling when you’ve been out at the beach all day: Your hair is salty, your skin is tight (but not burned! ), you’re finally just as comfortable in a bikini as jeans and a tee, and everything smells like suntan lotion. But the best is late in the afternoon, when you realize you’ve had enough sun and, frankly, you’re exhausted, so you head inside to find a comfy chair near a breezy open window (so you can still hear the ocean lapping against the shore, of course) to read a good book or catch a nap. That is exactly what makes vacations so magical. I love when spaces manage a coastal vibe without going over-the-top nautical (not that I don’t love a good anchor here and there). The colors are so soothing, and I can almost smell the ocean blowing in through those plantation blinds. I’m not sure what it is exactly that I’m saying “I want” here – that beachy feeling, these great chaise lounge chairs or a vacation – but I’d be more than happy with any of those options! Remember yesterday when I said I was seeing a place that sounded great on paper? Well, it was still pretty good in person – except for the landlord. First, he wouldn’t let me take pictures of the place (despite it being empty). Sure, that’s strange, but whatever. But then, THEN, he tells me the house rules: 1. No hanging out on the front steps. Um ok, there’s a big backyard, so I’m not sure why I’d bother. And 2. NO HAVING PEOPLE STAY THE NIGHT. Are you kidding me, gramps? If I’m going to pay nearly $1,000/month to live somewhere, I damn well will keep whatever company I want! This was a two bedroom, and I thought it’d be great to have family or friends come stay with me. I should have told the guy off then and there, but I’m too nice so instead I said I’d call him. Pssh, yeah right… What a nightmare this search is turning into!